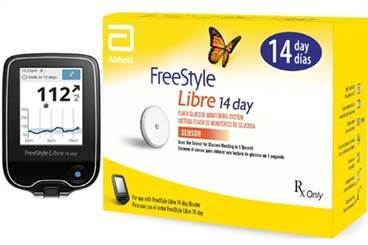 The FDA has updated its original approval of Abbott’s FreeStyle Libre CGM for 14-day wear with a one-hour warmup – now called FreeStyle Libre 14 day. (For background on CGM, click here.) The original US approval last fall was for 10-day wear and a 12-hour warmup, so this means that people will have much smaller gaps in CGM data when they start a new sensor and will insert new sensors less frequently (two sensors per month rather than three). The sensor and reader remain the same size; the difference involves minor software updates. This new version will launch in participating pharmacies and durable medical equipment (DME) suppliers in the US in the coming months. The FreeStyle Libre 14 day is similarly accurate to the 10-day version. Users should still check with a fingerstick during the first 12 hours after starting a new sensor – the time when sensors are still less accurate – but it is still a CGM that does not require daily fingerstick calibrations. Like the 10-day version, the FDA has approved it for dosing insulin. It is unlikely that the sensor pricing – $120 per month with most insured people paying $40-75 per month – will change. On the pipeline front, the FDA is currently reviewing a submission or use of FreeStyle Libre in children down to the age of four years. In exciting news, FreeStyle LibreLink, the mobile app that allows users to scan Libre with their smartphone rather than carrying around a separate reader device, has recently been approved by the FDA! The app is available in the Apple app store; it is not yet available for Android users. When compared to the Dexcom G6 (the other CGM that does not require fingerstick calibrations), FreeStyle Libre will have half the warmup time and a longer sensor wear time by four days. That said, based on the labels, Dexcom’s G6 appears to be more accurate in hypoglycemia, while also including alarms and mobile apps. Editor's note: This article was updated on 11/20/18 to reflect LibreLink's FDA approval.